Simplicity CRM is designed for use by any company, and features social media marketing and powerful reporting. Contact Simplicity for pricing details. Fully-integrated CRM that includes analytics & reporting, marketing tools, database, case management, customer interaction management. 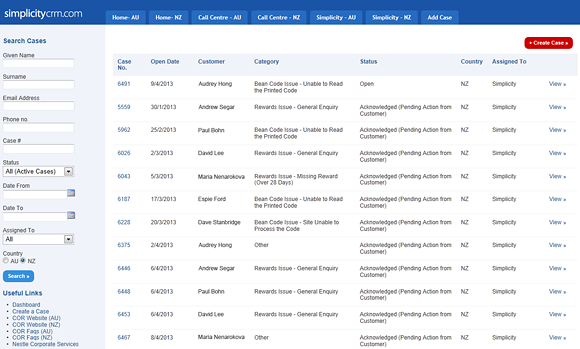 Simplicity CRM Reviews Recently Reviewed! Overall: Great price for all the functionality. Great up-time. Great customer svc. I was worried about a hosted collection system, but have been pleasantly surprised. The only issue is that the trust accounting/statement reporting doesn't seem up to par....but we might just need some more learning on it. I have used many CRM tools and this is one of the better ones I have used. Pros: The tool is simple to use, and easy to ramp up for beginners in my org. Easy to transition from one CRM to another. Cons: Accounting features are not that great and can use some improvement. Moreover, the software doesn't seem to provide any indication on down times, though rare. Overall: hands down the easiest and most efficient software to use. Customer service is outstanding!!! This software has increased our productivity and our recovery rates!